Premium Christmas Party Entertainment that your company deserves! 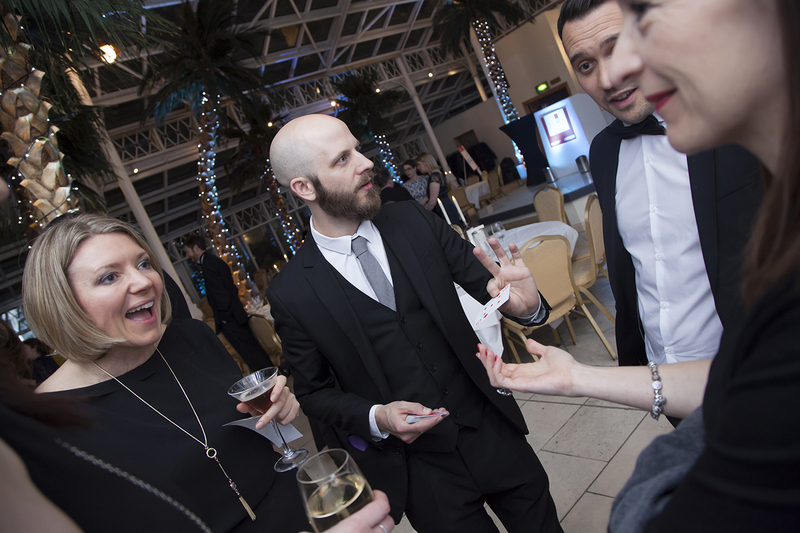 Magician, Mindreader and Hypnotist Chris will MAKE your Christmas Party. If you have been tasked with arranging your work’s Christmas Party or Staff’s Work Meal then arranging suitable Christmas Party Entertainment needn’t be a difficult part of it. A Christmas party isn’t just a time to celebrate Christmas time itself, it is a chance for your company to show just how much you respect your employees and reward them for all of their hard work throughout the year by putting on an event that reflects this. Perfect Christmas Party Entertainment for Any Event. Whether you are arranging a sit-down 3-course meal for 200 employees or just a handful of workers at a pub Chris’ Christmas Party Entertainment will leave everyone feeling happy, entertained or just plain baffled. Chris’ Diary for last year was filled up with a huge amount of different Corporate Events and Christmas Parties and is expected to be even busier this year – he had to disappoint several companies who tried to book him last minute and found that he was already booked so don’t leave it too late. 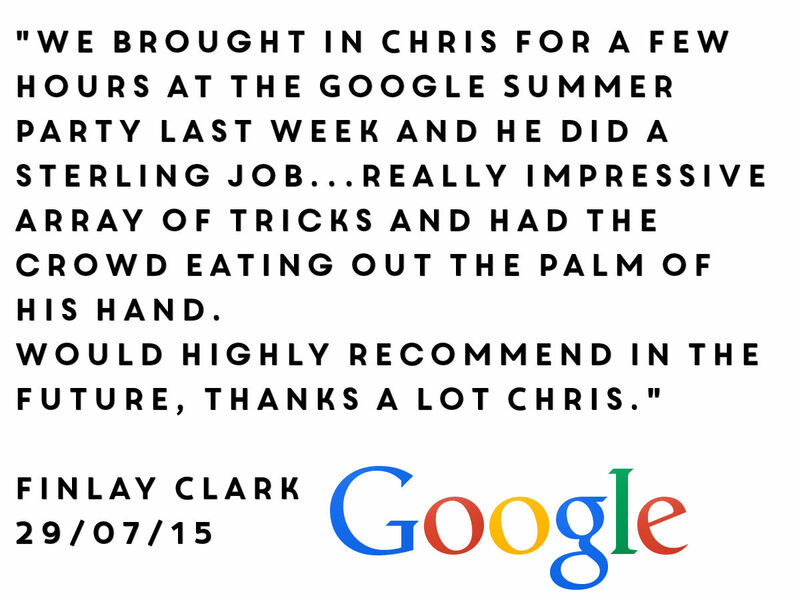 Chris is equally adept at mixing and mingling around a cocktail party as he is at performing table-side magic at a sit down meal, so no matter what the size of the event or the type of celebration you are having Chris will tailor his performance to it perfectly. 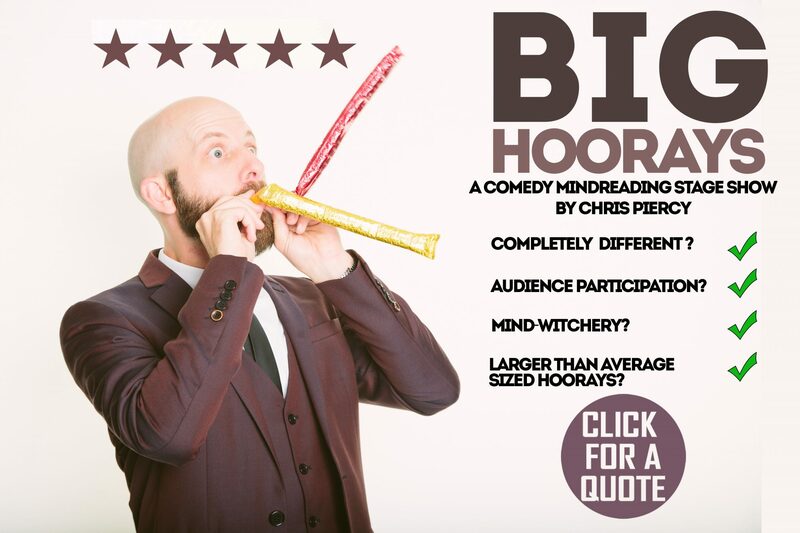 Chris is now offering his one man comedy mind reading show “Big Hoorays” which has been described by audiences as “astounding, funny, entertaining, baffling, mindboggling and captivating” as well as many other things. Get in touch with Chris today to discuss your event and your requirements for entertainment, Chris will talk you through the different options available to you to ensure that his performance has the maximum impact that leaves everyone with a strong and lasting impression of the evening. Chris has put together 3 excellent packages for the 2017 Christmas Party season – details are below. Pricing depends on the location of your event as well as the date, Fridays and Saturdays in December are in incredibly high demand and are operated on a first come, first served basis. If for any reason you think the offered packages are not quite suitable please ask for a bespoke package to fit your event perfectly. Chris will perform combination of Magic and Mindreading as deemed suitable for the event and setting. This is perfect for covering the drinks reception and start of an evening meal (for example). A remarkable and memorable 3-hour performance. In addition to the above Chris offers the option of Mix and Mingle Hypnosis. This is perfect for covering the drinks reception and the whole of an evening meal (for example). A FULL EVENING performance from Chris. Chris will perform combination of Magic, Mindreading and Hypnosis as deemed suitable for the event and setting. Chris will perform magic that leaves your staff with physical souvenirs from the magic they’ve witnessed. In addition to ensuring there is entertainment throughout the evening Chris will perform is Comedy Mindreading Stage Show “Big Hoorays” to the whole party as either pre or post dinner entertainment. This is full of laughter, audience interaction and the will be the talk of the office for weeks and months to come. Updated on 2017-09-26T13:07:23+00:00, by chrispiercy.